Can Deep Brain Stimulation Enhance Memory in Alzheimer's Patients? The medial temporal structures, including the hippocampus and the entorhinal cortex, are critical for the ability to transform daily experience into lasting memories. We are certainly getting some interesting research on the brain this past week. This should quiet the naysayers that have somehow concluded that nothing is being done to solve the mysteries of the brain as they relate to Alzheimer's disease. While the study described below is small, it does raise some intriguing possibilities. The issue could the brain of someone suffering from Alzheimer's have their brain electronically stimulated in a way that would open the door to recall via the entorhinal cortex. 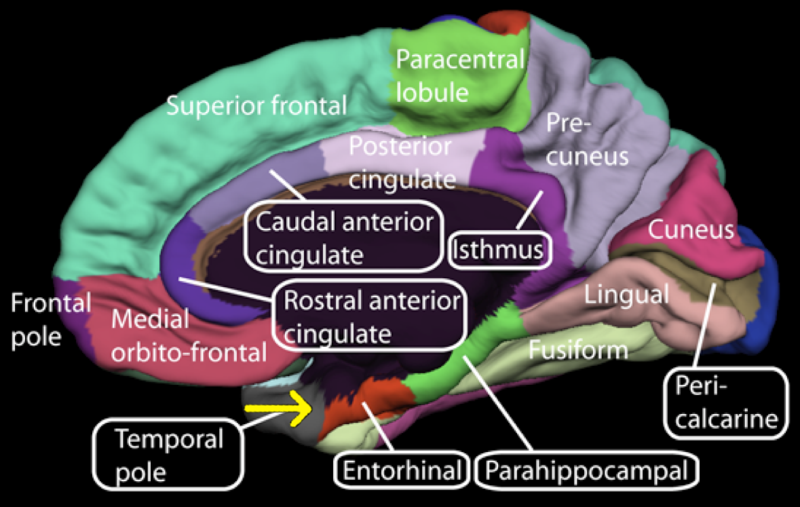 The entorhinal cortex is the doorway to the hippocampus. The entorhinal cortex - hippocampus system plays an important role in memory storage, and in particular spatial memories including memory formation, memory consolidation, and lasting memory. This line of research has interested me for some time. Ever gone to the movies and forgotten where you parked the car? New UCLA research may one day help you improve your memory. UCLA neuroscientists have demonstrated that they can strengthen memory in human patients by stimulating a critical junction in the brain. Published in the Feb. 9 edition of the New England Journal of Medicine, the finding could lead to a new method for boosting memory in patients with early Alzheimer's disease. The UCLA team focused on a brain site called the entorhinal cortex. Considered the doorway to the hippocampus, which helps form and store memories, the entorhinal cortex plays a crucial role in transforming daily experience into lasting memories. "The entorhinal cortex is the golden gate to the brain's memory mainframe," explained senior author Dr. Itzhak Fried, professor of neurosurgery at the David Geffen School of Medicine at UCLA. "Every visual and sensory experience that we eventually commit to memory funnels through that doorway to the hippocampus. Our brain cells must send signals through this hub in order to form memories that we can later consciously recall." Fried and his colleagues followed seven epilepsy patients who already had electrodes implanted in their brains to pinpoint the origin of their seizures. The researchers monitored the electrodes to record neuron activity as memories were being formed. Using a video game featuring a taxi cab, virtual passengers and a cyber city, the researchers tested whether deep-brain stimulation of the entorhinal cortex or the hippocampus altered recall. Patients played the role of cab drivers who picked up passengers and traveled across town to deliver them to one of six requested shops. "When we stimulated the nerve fibers in the patients' entorhinal cortex during learning, they later recognized landmarks and navigated the routes more quickly," said Fried. "They even learned to take shortcuts, reflecting improved spatial memory. "Critically, it was the stimulation at the gateway into the hippocampus – and not the hippocampus itself – that proved effective," he added. The use of stimulation only during the learning phase suggests that patients need not undergo continuous stimulation to boost their memory, but only when they are trying to learn important information, Fried noted. This may lead the way to neuro-prosthetic devices that can switch on during specific stages of information processing or daily tasks. Six million Americans and 30 million people worldwide are newly diagnosed with Alzheimer's disease each year. The progressive disorder is the sixth leading cause of death in the United States and the fifth leading cause of death for those aged 65 and older. "Losing our ability to remember recent events and form new memories is one of the most dreaded afflictions of the human condition," said Fried. "Our preliminary results provide evidence supporting a possible mechanism for enhancing memory, particularly as people age or suffer from early dementia. At the same time, we studied a small sample of patients, so our results should be interpreted with caution." Future studies will determine whether deep-brain stimulation can enhance other types of recall, such as verbal and autobiographical memories. No adverse effects of the stimulation were reported by the seven patients. Fried's coauthors included first author Nanthia Suthana, as well as Dr. Zulfi Haneef, Dr. John Stern, Roy Mukamel, Eric Behnke and Barbara Knowlton, all of UCLA. The research was supported by grants from the National Institute of Neurological Disorders and Stroke and the Dana Foundation. Stimulation of the entorhinal region enhanced memory of spatial information when applied during learning. The UCLA Department of Neurosurgery is committed to providing the finest and most comprehensive patient care through innovative clinical programs in minimally invasive brain and spinal surgery; neuro-endoscopy; neuro-oncology for both adult and pediatric brain tumors; cerebrovascular surgery; stereotactic radiosurgery for brain and spinal disorders; surgery for movement disorders such as Parkinson's disease; and epilepsy surgery.